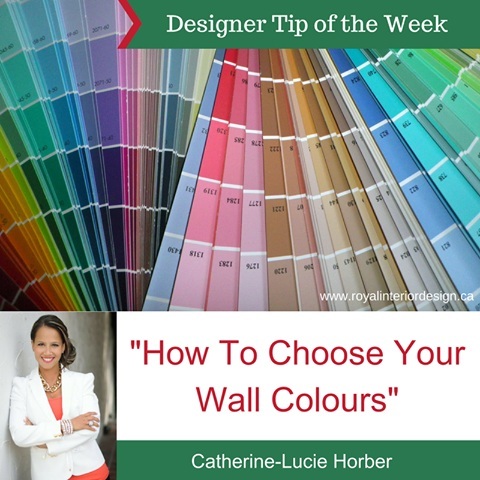 How can I select a wall colour on your walls that will truly reflect what's best in your space if I don't know what will go in the space? When designing I always resort to INSPIRATION pieces, artwork or fabrics. These are the best way to inspire you and get a great design palette together. From a fabric, you can select light colours to go on your walls, accent walls, funky bold colours of the fabric on pillows or chairs etc. It then becomes much easier to select your "perfect" wall colour as there are so many shades and hues of blues or greys. It is like putting the cart before the horse! So many times my clients have had to repaint rooms multiple times prior to meeting with me, not knowing which shades to select. That's because choosing random colours without an action plan is much harder. I literally take my favourite fabric chosen for the space and my colour fan deck and start choosing and comparing from there. It makes it much easier but also cohesive and flows and allows you to have fun with the different rooms with complimenting colours within your chosen palette. Like a darker, moodier colour in a dining room, a funky bold colour in powder room, a light light colour in main hallway, a medium shade in family room, classic neutral in living room etc. Choosing the right colour for your spaces is an art that I love helping my clients with when planning and designing their multiple spaces. Finding an inspiration source that they love is "key" in achieving the desired outcome.